Despite its steep housing prices and long commute times, San Francisco is still a net attracter of talent, with the number of people moving to the San Francisco Bay Area continuing to outweigh the number of people leaving for cities that have lower costs of living, according to the April LinkedIn Workforce Report. The broader trend to note, however, is the number of people moving to San Francisco dropped 41.7 percent since February of last year. Our data found that San Francisco is losing talent to cities where large tech companies have established a growing presence and overall living costs are notably lower, such as Seattle, Denver, Austin, as well as less expensive “commuter towns” further outside the Bay Area, like Sacramento, Stockton, Modesto, Fresno, and Salinas. Hiring keeps up the pace through March – In March, hiring across the U.S. was 19.3 percent higher than in March 2017. Seasonally-adjusted hiring was 3.1 percent higher in March than in February 2018. Hiring has been slightly better through the start of 2018 than it was in the second half of 2017, but year-over-year comparisons will become more challenging as we move into spring, when hiring skyrocketed last year. In line with national hiring trends, the industries with the biggest year-over-year hiring increases in March were financial services and insurance (20.9 percent higher); aerospace, automotive, and transportation (19.0 percent higher); and manufacturing and industrial (18.8 percent higher). Notably, hiring seems to be slowing in the professional services industry: after a strong run in 2017, seasonally-adjusted hiring fell in February 2018, stayed flat through March and was only up 9.9 percent year-over-year – much less than the national average. Top destinations for grads looking to go green – The fastest-growing hubs for people skilled in renewable and sustainable energy, ecology and environmental science, and green building and construction are Greensboro-Winston-Salem, Salt Lake City, Las Vegas, and Nashville. And the hottest hiring markets overall – where people with these same skills are most likely to get hired – are Raleigh-Durham, the San Francisco Bay Area, and Boston. So if you have environmental science skills and are looking for a job, these cities are a great place to start your search. Or if you’re looking to join an existing, environmentally-minded community, look no further than Sacramento, Denver, and Portland, where people with environmental skills are more prevalent as a proportion of the local population than in any other city. 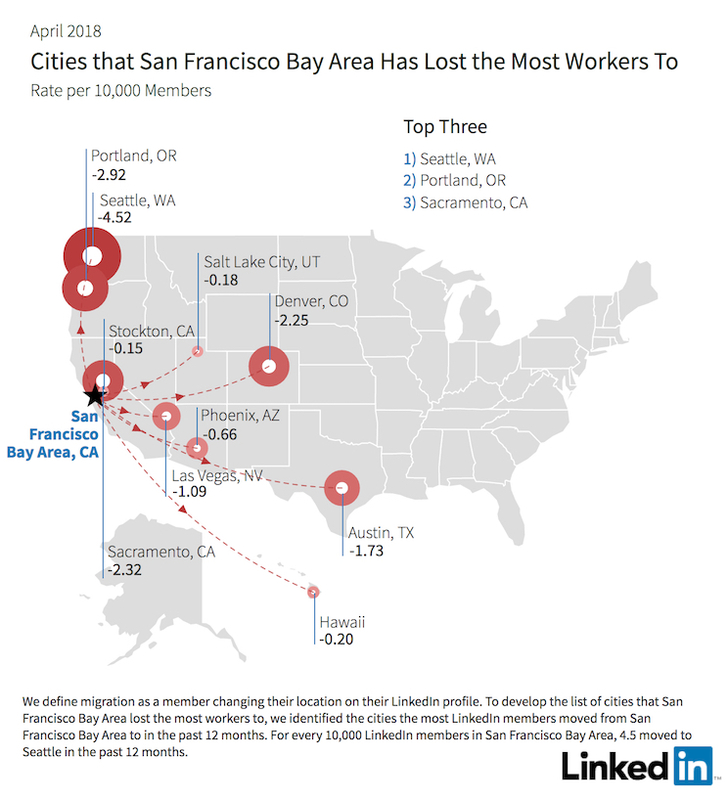 Click here to read of our April LinkedIn Workforce Report, including which cities are losing the most workers, and which are gaining the most.